I didn’t drink much wine before moving to Argentina. But it wasn't long after stepping foot in Buenos Aires before wine (the country's official beverage) began to take over. Wine is very affordable in Buenos Aires and the quality is reliably fantastic. So obviously, Mendoza is a favorite destination of mine. I've been to Mendoza twice now, spending a total of eight days (so far) tasting wine and visiting the best Mendoza wineries. It's my favorite area of the country. 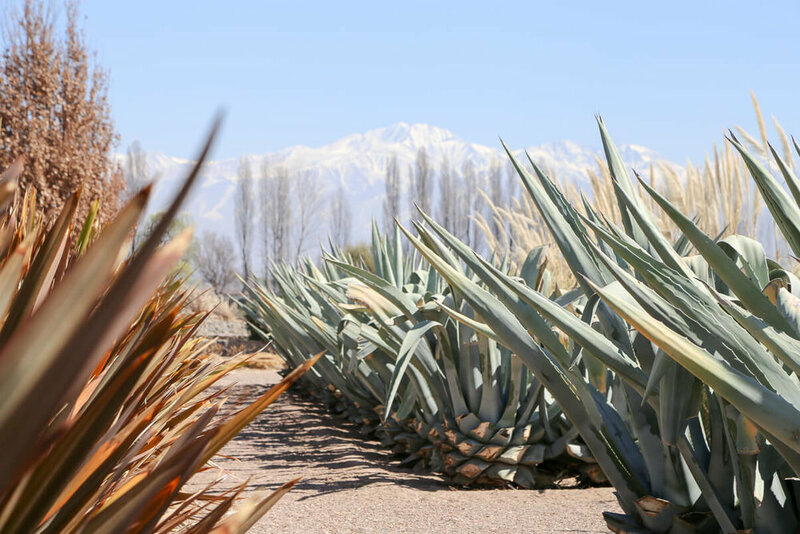 Besides tasting wine directly from the source, the location at the foot of the Andes Mountains offers a stunning backdrop that is hard to beat. This post is a complete guide to help you plan your visit to the mecca of Malbec, including a breakdown on the three wine regions here, the best wineries in Mendoza and how to tour them. The best time of year to visit Mendoza is generally from October until April, from planting until harvest. Spring (September-November) will be warm but with great weather! Visiting in summer (January and February)? Expect hot temperatures and intermittent rains. The best time to visit is in March (in the Fall) for harvesting (the "cosecha" or vendimia). However, Mendoza is a great destination year-round. We've visited in September and in March. In March, we were there a week before the actual harvest festival, so we were able to see the vines lush and full of grapes. In September, we were there just after most wineries had done their pruning, so we didn't see any vines (and it was still beautiful!). The vines will begin to regrow for spring at around the end of September. Mendoza is to wine lovers what Disney World is to a 6-year-old, paradise. Wineries are everywhere, they are beautiful and best of all, they are very affordable to visit. Here's the lowdown on visiting the best Mendoza wineries. Maybe you're wondering why even bother wine tasting in Argentina, or anywhere at all for that matter. But you don't need to be a sommelier or a sophisticated gourmet to enjoy wine tasting. Visiting wineries and tasting a variety of wines (both in grape varietals and different price ranges) will help you define what you like best. Seeing how wine is made and all of the work and dedication that goes into it will give you a new appreciation for it. You'll learn how to taste and before you know it, you'll be the person announcing to the dinner party that you taste hints of lemongrass in your sauvignon blanc! Mendoza is divided up into different wine "departments' or regions and each has its own particular charm. They are Maipu, Lujan de Cuyo, and the Uco Valley. I've been to them all and boy, do I have opinions. I've listed them below starting with the closest to the city and radiating outwards. I've listed the best wineries in each region and scroll even further in this post for sample wine tasting itineraries. Starting with the area closest to Mendoza city proper and possibly the easiest to visit, Maipu. This area is quite popular with backpackers. It was also my least favorite. The main road was very industrial, alongside the bike lane were mainly 18 wheeler trucks and large lorries, not exactly fitting with the romantic image I had imagined of riding among the vines. Once we were in the wineries themselves they were quite beautiful. Two of them included a free bottle of wine to take away as a part of the tasting package. If you're planning on biking, rent bikes from Mr. Hugo's Bikes and follow his map of the area. You can take a bus or a taxi to get to get to Mr. Hugo's. Note: I'm not including contact information for these. While booking ahead of time is essential elsewhere, if you're biking with Mr. Hugo's bikes, these wineries are expecting you. Bodega La Rural: If you're interested in history you'll love La Rural and their museum filled with wine production antiques. 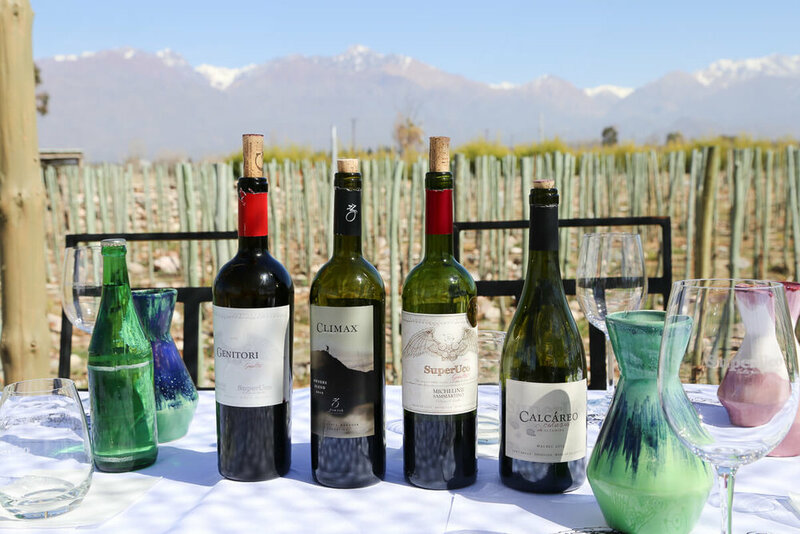 Unlike most Mendoza wineries, most of their wine is consumed locally, rather than for export, so if you're visiting from abroad their wines may be new to you. Tempus Alba: We went to Tempus Alba for lunch on their terrace. Lunch was decent and the views were nice. We skipped a tour and tasting but followed their self-guided walk through the vines and olive trees reading the plaques along the way. Mevi: This is another good option for lunch on the bike route of wineries. We skipped the full tasting in favor of ordering a glass to enjoy on their terrace (we'd had quite a bit of wine by this point). The photo above is on their terrace, the Malbec Rose in my hand was very good. Trapiche is the one winery in Maipu I wish we had had time to visit but weren't able to. Luján de Cuyo, now we're talking. I love Lujan de Cuyo. It's also incredibly easy to get to from the city center. You can take a city bus from Mendoza to Chacras de Coria, that takes about 45 minutes. A taxi will be very affordable as well and only take 20 minutes. In Luján de Cuyo you're closer to the Andes than in Maipu, making the views much more impressive. I always recommend Lujan over Maipu to those that want to bike to the wineries. Baccus Bikes was such a great experience (not an ad, just genuine love). The woman who welcomed us set us up with an itinerary by calling the wineries ahead of time so they would be expecting us as well as arranging our lunch reservations. If you don't speak Spanish, you can also hire a guide who will bike with you as your personal translator, I highly recommend this. If you're visiting with Baccus Bikes, you don't need to make reservations ahead of time. They'll make an itinerary with you and call the wineries to let them know you're coming. If you're visiting wineries on your own, it's best to reserve ahead of your visit (contact information for each winery is included below). CARMELO PATTI | This is a must visit if you're in the area. I've been twice! It's a garage winery, which means there is no cellar, but really it's also in a garage-like warehouse. Carmelo Patti (seen above) is the winemaker, owner, and even the tour guide! Just show up and he'll give you a tour free of charge. If you buy a bottle, he'll likely sign it and write which year to open it for best results. No reservation needed, check his Facebook page here for hours. LAGARDE |Lagarde has excellent wine and a beautiful old estate. I loved touring this winery and of course, tasting their wines. If you're looking for a more upscale restaurant for lunch, their restaurant is one of the best. phone: (+54 261) 498-5185 / 0011 and (+54 261) 6815961. CLOS DE CHACRAS | This boutique winery is located in downtown Chacras de Coria, but once you're through the gates you feel like you're miles from the city. Taste their wine on the deck next to their large coy pond or enjoy lunch in their dining room. It is possible to visit the above by bike with Baccus (among many others not listed). The wineries listed below need a car, driver or may be possible by hop on hop off bus. MELIPAL | We visited Melipal recently and it was one of our favorite wineries of the entire trip. The building is impressive and modern, nearly blending in with the surrounding landscape while also standing out among the vines. If you can make it to Melipal, you won't regret it. A16 | I chose A16 purely because I'd never heard of it before. I like to visit boutique wineries or wineries that are new to me, rather than try wines I see all the time in the shops at home. The random choice paid off because the wine was delicious and our tour guide was very friendly. I particularly loved their white wine made out of Malbec grapes! CAVA DE CANO | One of the best lunches on our first trip was at Cava de Cano, a restaurant housed in the old governor's residence. We were ushered down to our private dining room, which was inside the old water tanks in the basement. Great ambiance! The table was set with the mother of all picadas: meats and cheeses, vegetables, malbec infused rice, malbec infused everything. This was just the first course. Open Wednesday-Sunday and reachable with your Baccus bike rental. OJO DE AGUA | We had a delicious three-course lunch with wine pairings at Ojo de Agua. We sat outside on the porch by the vines with a view of the snow-capped Andes. The fact that the food was fantastic was icing on the cake of an already great experience. They don't sell their wines in Argentina or the US, so eating here may be the only chance you get to try their wine. Obviously, I enjoyed it. We’ve gone three times! It's accessible and beautiful. It felt more rural than the area of Mayor Drummond in Maipu, where we were surrounded by trucks. The quality of wines was also better than those we tasted in Maipu. Don't think twice about visiting this region. The Uco Valley is the END ALL BE ALL. It is stunning. Set at the foot of the Andes, the vistas are breathtaking. The quality of wine produced here is top notch and you'll be hard-pressed to have a better experience than the one you'll have in the Uco Valley. 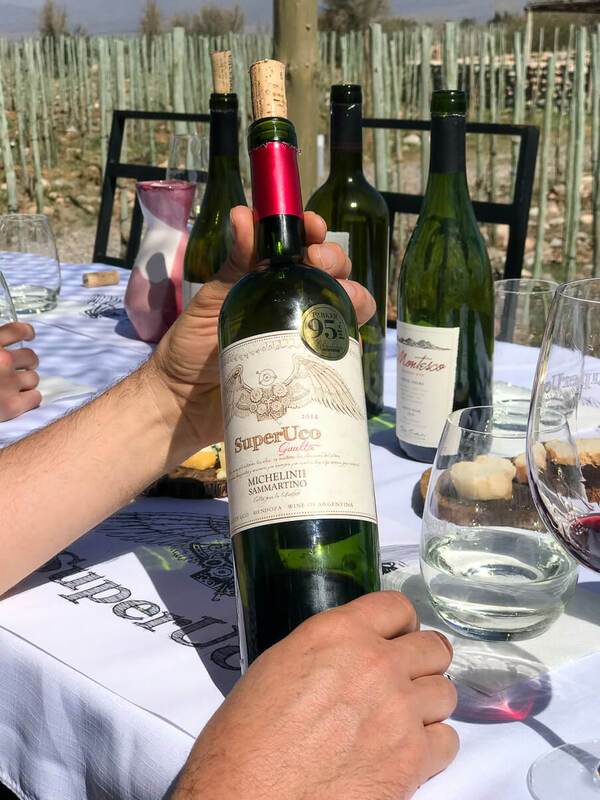 Valle de Uco is widely considered the best wine region in Argentina so if you only have one day to spend tasting wine in Argentina, then choose a tour that will bring you here. You must absolutely make reservations ahead of time, so spend some time planning your itinerary before you leave for Argentina. If you're touring with a private driver, they may take care of it for you (check to be sure). O. FOURNIER | This winery is far. But, it's worth every minute you sit in the car to get there. It took us an hour to get there from Tupungato and it will take an hour and forty minutes from the city of Mendoza. The wines were spectacular and the building was as well. If you love architecture, you're in the right place. The highlight for me (besides the wine, of course) was the massive tanks that also served as structural columns. SUPERUCO | This was my favorite tour and tasting. This winery is owned by the four Michelini brothers and is a family passion project. They grow and produce their wines organically and biodynamically, aiming to keep everything as close to the way nature intended as possible. You can see this in how they grow their vines to how they've designed the architecture of the building itself. The tasting took place on their deck, with a view to the Andes in front of us. It was a great experience and I highly recommend visiting SuperUco. Tours are in Spanish or English, but English tours are available every day except Tuesdays or Wednesdays. BODEGA LA AZUL | We had lunch here on both of our visits. I liked it so much the first time that I was thrilled when they invited me back. Bodega la Azul offers a 5-course lunch with wine pairings. I can say confidently this is the best lunch I've ever had, twice. The wine flows freely and the views are unbeatable. After lunch, you are taken for a private tasting of a reserve wine straight from the barrel. DOMAINE BOUSQUET | French-owned Domain Bousquet makes organic wines in the Uco Valley. 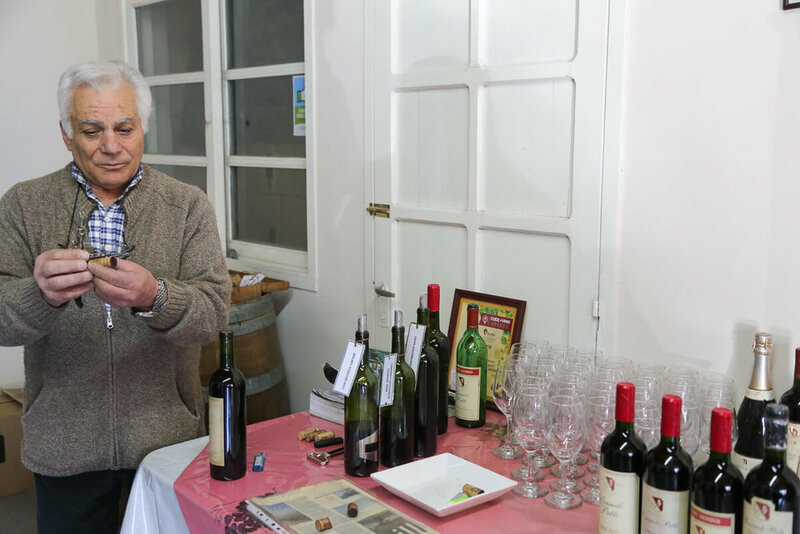 The father of the current owners came to Argentina after searching the world for the perfect location to support organic wine production. Lucky for us, the dry desert air in Mendoza was perfect. ANDELUNA | Andeluna is still on my to-visit list for my next Mendoza visit (oh I'll definitely be back again). I've heard amazing things about their wines and having driven by, it's stunning. A++++ If you can make it to the Uco Valley, DO IT. It's further from Mendoza city, but it's worth the trek. The wines are the best you'll taste and the views are incomparable. I loved it so much that I've been twice and on any future trip to Mendoza we will only stay here. A team of two architects together make up the firm Bormida y Yanzon. If you love architecture and design, you'd be well served to take their projects into account when planning your wine tasting itinerary. 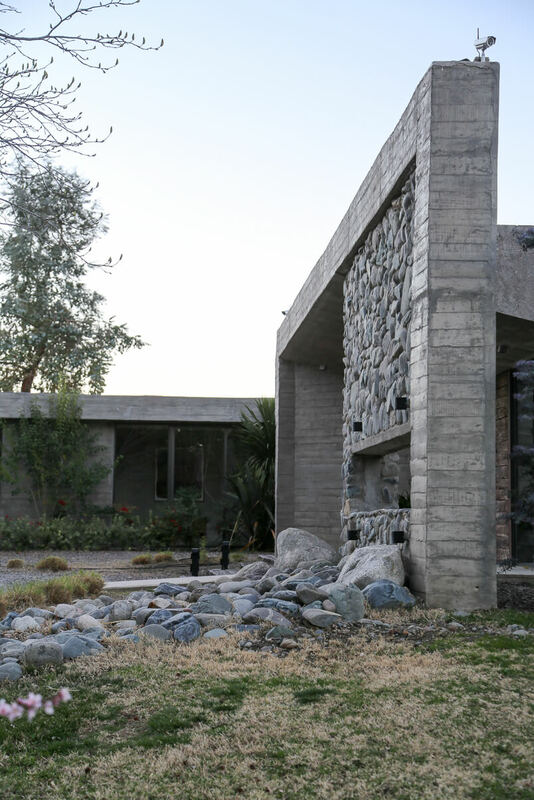 Together they have designed the most impressive buildings that dot the landscape across Mendoza. They incorporate innovative materials such as concrete, stone, wood, and glass into their projects that result in a building that echoes the land around it. Their winery projects are both modern and functional but also fit perfectly into the natural landscape of Mendoza. A few noteworthy bodegas that they've designed include Salentien, O. Fournier (above), Septima and DiamAndes. If you're interested in learning more, put this article about them through Google Translate. For a complete list of their projects visit their website, click on proyectos, then bodegas. There are SO many Mendoza wineries to visit but how does one visit them? There are wine tours galore, hop on hop off buses and (my personal favorite) you can rent a car to take complete control of your trip. I'm a total advocate for the rental car industry because I think there's no better way to explore a new place than with your own car. At least in a country as expansive as Argentina. If you're willing to leave the city and stay in a resort among the vines (scroll to the end on where to stay), you'll need a car. Also, my favorite wineries (and the most beautiful) aren't accessible by bike or public transportation, and perhaps the cheapest option will be a rental car. Warning, manual transmissions are most common here. Renting an automatic will be more costly. Check rates here for rental cars from the Mendoza airport. The next best thing to renting your own car is hiring a driver to take you on a customized tour. And if it's in your budget, it may even be the best option because you won't have to worry about driving after all that wine tasting. A driver will pick you up from your hotel and see to it that you have the best day possible. I particularly like this tour because he brings you to the Uco Valley. This area is without a doubt home to the best wine and the most beautiful Mendoza vineyards. Check rates and reserve your tour here . Don't want to drive but don't want to pay for a driver? Take the hop on hop off bus to hit up the best wineries, the tickets are an affordable $22 US. They operate in different wine regions depending on the day of the week. I personally recommend the El Rio and Valle de Uco days if they work for your itinerary. Reserve your hop on-hop off bus here. Out of the three wine regions, two are bikeable. You can bike in Maipu and Lujan. The two companies worth your time are Mr. Hugo's Bike Rentals in Maipu and Baccus Biking in Chacras de Coria in Lujan. Of the two, I wholeheartedly, without a doubt, recommend Baccus (I've done both and speak from experience). Planning your day of wineries in Mendoza can be overwhelming. There are so many to choose from and information about the winery's tours aren't often displayed clearly on their websites. Plan well to make sure you have a great Mendoza wine tasting experience and not ruin your wine tasting. If you're driving yourself, you'll need to contact the wineries ahead of time to make your reservations. In the itineraries below I've linked to their websites. There is usually an email address, phone number or contact form under the tourism section of their site. If you've hired a driver, they should take care of this. Most wineries begin offering tours from 10 am. Ideally, you'll visit two wineries at 10 am and11:30(ish) and a third for lunch. Lunches are best at the winery's themselves, most offering a fixed coursed menu with wine pairings (even more vino!). Pro Tip: I always like to have a few extra wineries in mind that are nearby. I won't reserve a tasting with them in case there's no time. Two tours and a lunch can usually fill the day. But if there is time, I'll swing by and see if they have time to squeeze me in for a tasting (you won't have time for a third tour). If I were to plan a wine tasting in Valle de Uco Itinerary for a friend, this is the day I'd schedule for them. O. Fournier - 10 am - This winery is the furthest, so start here and work your way back up. Their first tour is at 10 am, so wake up early and eat a hearty breakfast to prepare yourself for all that wine you'll be drinking today. SuperUco - 12 pm - It will take you 40 minutes to drive here from O. Fournier so you'll need to schedule SuperUco for no earlier than noon. Optional Bonus Tasting at Corazon del Sol or Solo Contigo: If you have time for an extra tasting after SuperUco and before your lunch reservation, see if you can squeeze in a quick tasting at one of these two wineries. They're on the same property as SuperUco (as they form part of The Vines). Bodega Azul - 2:30 pm for lunch - You'll spend the remaining hours of your afternoon hours here, so sit back and enjoy the meal. Stretch your legs in between courses under the Mendoza sun looking at the mountains, or lounge on the sofas in the grass after lunch. This is my ideal day in Lujan de Cuyo, and it's tried and tested because this is how we spent a day here this year. You'll need a car or a driver for this itinerary as these wineries aren't reachable by bikes rented from Baccus. It's worth the effort, I promise. A16 - 10 am - Start your day with a tasting and a tour at A16. Melipal - 11:30 am - Melipal is only a few minutes from A16 so it was ideal and we made it just in time for our tour and tasting here. Ojo de Agua - 1:30 pm for a winery lunch - It took us about 15-20 minutes to drive to Ojo de Agua from Melipal. Enjoy a leisurely lunch, we finished lunch at 4 pm. Optional Bonus Tasting after lunch. Wineries close at 5 or 6 so if you play your cards right you can squeeze in one last tasting (no tour) after Ojo de Agua. Choose from: Septima, Cruzat, Viña Cobos or Ruca Malen. Use the following map to see the locations of the best Mendoza vineyards, hotels & restaurants. Most people choose to base themselves in the city of Mendoza and take day trips to the wineries or into the mountains. But I believe that Argentina is one of the most beautiful countries in the world due to its stunning landscapes, not for its cities. So, should you stay in Mendoza city or in the countryside on a wine resort? Is staying in Mendoza city proper for you? If you're nervous about renting a car and setting out on your own in a foreign country, stay in Mendoza and take tours (there are plenty, see the above list!). If you're a backpacker or young solo traveler who wants to meet fellow travelers or enjoy the nightlife, stay in the city. If a rental car is in your budget, I personally recommend skipping the city and staying in the Uco Valley. The Uco Valley is what dreams are made of. Hotels are set up amongst the vines at the foot of the Andes. It's peaceful and idyllic. On our recent trip, we spent three nights in the Uco Valley split between two hotels, it was a dream y'all. We spent two nights in Tupungato Divino and it was, well it to repeat the name, it was divine. At only $97 US a night it was very affordable. It's made up of small cabins set on a farm that grows grapes to sell to other wineries. The view from your bed consists of vines, the Andes and one hell of a sunset. There's a restaurant on property serving up simple but very good lunches and dinners. Check rates here. We also stayed at Finca la Azul Guesthouse. It was ideal after having lunch at their restaurant and drinking all their wine. The winery and guesthouse are a family project, and the hotel itself is actually the family’s original home that’s been reformed into a luxury wine hotel. I can’t imagine being lucky enough to live in such a beautiful location, but lucky for us we were able to pretend it was home for one night. Check rates here. 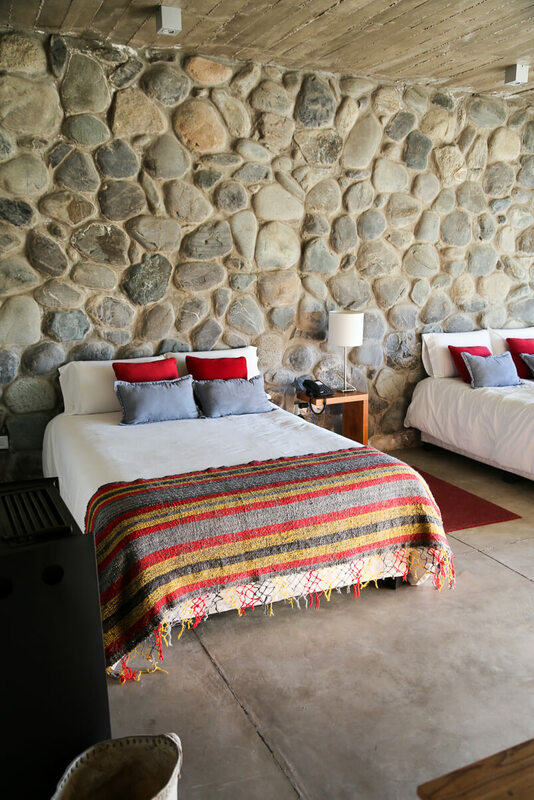 If you'd feel more comfortable staying in Mendoza city proper, here are some great options for accommodation in Mendoza to consider. Bed and Breakfast Plaza Italia | We stayed in this B&B on our first visit to Mendoza and it was great! It was before my blogging days so I don't have any pictures of it to show you, but I can promise that the pictures here are accurate. The owners were so friendly and gave us fantastic restaurant recommendations. It's centrally located and ideal for couples. Check rates for your stay here. Park Hyatt Hotel Mendoza, Hotel & Casino | If you're looking for luxury hotels in Mendoza, this is it. It's beautiful (I completely rubbernecked as we walked by it. It's also perfectly located, right on the main square in the center of town. Check prices here. Hostel de las Artistas | This hostel is a beautiful home that's been converted into a hostel. It's decorated well with artistic touches in the common areas, including a piano and record player. There's also a great garden to lounge in and take in the sun after a day of wine tasting.Check rates here. Windmill | Traveling solo? Windmill has a ping pong table and darts in the common spaces (great way to meet fellow travelers!) and is ranked well for traveling alone. It's well located, offers breakfast and wifi. What more do you need? (Oh yeah, wine, I'm sure it's cheap nearby). Check rates here. Break Independencia | This hostel is located in a large, beautiful historic building. Just take a look at the lobby! It's not a chain hostel but offers a more local perspective. Check rates here. If you want to do something that *gasp* doesn't involve wine, there are plenty of adventure activities to do in Mendoza. The location next to the Andes Mountains offers a lot of choices for the active traveler. There are hikes, mountain biking, white water rafting and horseback riding excursions. If you're staying in the Uco Valley, there are hikes and horseback riding excursions that leave from the Manzano Historico south of Tupungato. Your hotel should be able to arrange a tour and guide for you. We chose to drive to the town of Potrerillos in the foothills to spend a couple of days relaxing and breathing that fresh mountain air. We were invited on a horseback ride and rafting experience, but all opinions expressed below are my own. We really loved Potrerillos and if you arrange a rafting tour from the city of Mendoza, it will happen here in Potrerillos. We went on a short hour and fifteen-minute "cabalgata" or horseback ride with Rincon de los Oscuros. They are based in Potrerillos and the landscapes we rode through were stunning! I would have liked more time, so if you book with them book the two-hour ride. Check out their packages on their website here. We went white water rafting with Potrerillos Explorer. I admit that I was a little nervous beforehand, I did not want to fall into that ice cold river! But they were very thorough in preparing us and I felt very safe the entire time. The river will get higher and the rapids more rough as temperatures warm. Expect a relaxing ride in winter and an adventure in January's summer heat. Reserve your rafting experience or one of their many other tours here.